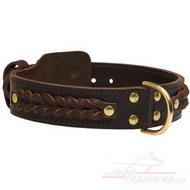 Dog collars can be of different collars today, including black, brown and tan. 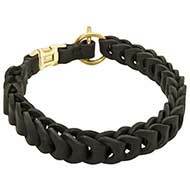 We make our dog accessories in all of these, and now we'd like to present you a tan leather dog collar with braid. It is indeed very stylish and comfortable, because it is padded with soft nappa leather and adorned with the most beautiful leather braids ever! 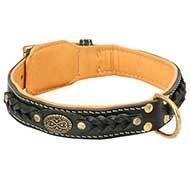 If you want to make your furry friend's style evident to everyone, simply put our Tan Braided Leather Collar on him! Genuine tan leather is the basis for this wonderful collar. 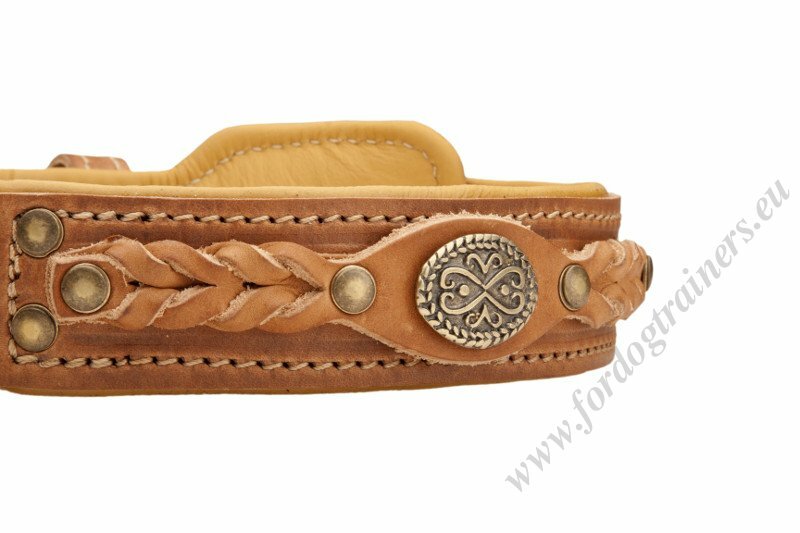 We never allow doubled-up fillers or machine stitches – this padded dog collar is made by skillful specialists by hand. 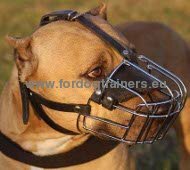 You can use it with pleasure to handle strong medium and large-size dog breeds thanks to its optimum width. 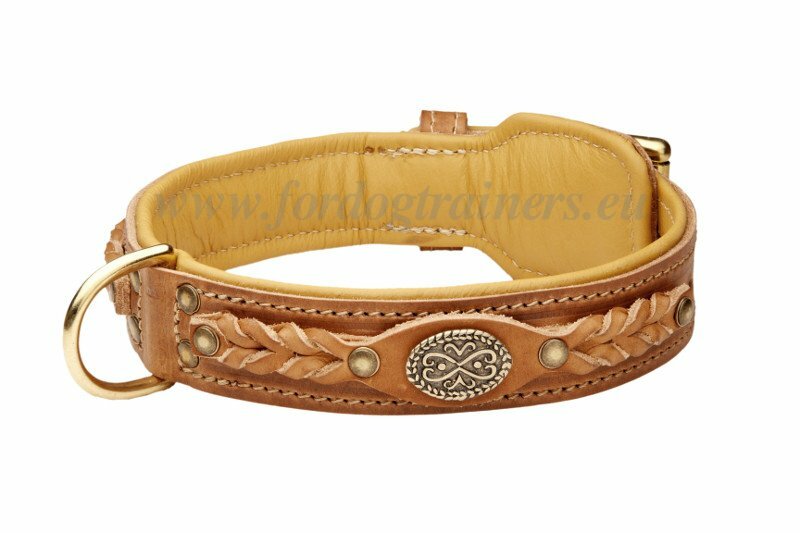 Special design which includes tan leather braids and original metal decoration will always be the distinctive feature of your pet's gear. 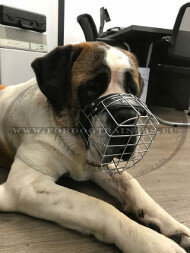 Moreover, we have thought about the hardware of this stunning braided dog collar – its buckle and D-ring for a leash are made of solid brass of high resistance. The braids and hardware are riveted to the collar with the help of small smooth rivets so that the collar serves you as long as possible. 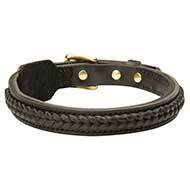 As the collar is padded with nappa, it does not cause skin rubbing or allergies. Besides, we have minimized a risk of discoloration problem due to the limited contact of hardware with the dog's coat. Our Tan Braided Leather Dog Collar is that very accessory for handling you are looking for, if you prefer tan collar to any other one, and value supreme quality dog training and walking gear! 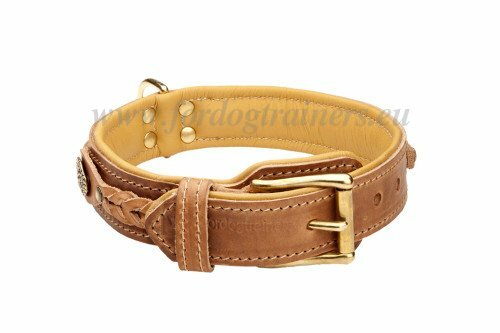 See other Luxurious Leather Dog Collars, Leather Dog Leashes, Excellent Training and Walking Harnesses and other outstanding products for your dog in our on-line pet store! The collar is excellent! Beautiful thick leather of good quality and a very soft padding. I would order the same again.